HURTGEN: Hell’s Forest is a grand-tactical simulation of that enormous campaign. The 2,240 counters in the game represent almost every formation, at company and battalion levels, which fought in the battle, including US, German, British, and even Belgian units. Infantry, armor, anti-tank, reconnaissance, engineer, assault gun, howitzer, rocket, parachute, ranger, glider, and headquarters units are all fully represented in the counter-mix. The two map sections are an accurate representation of the battle area and were compiled from 1944 German staff maps and 1943-1944 US Army map sources. 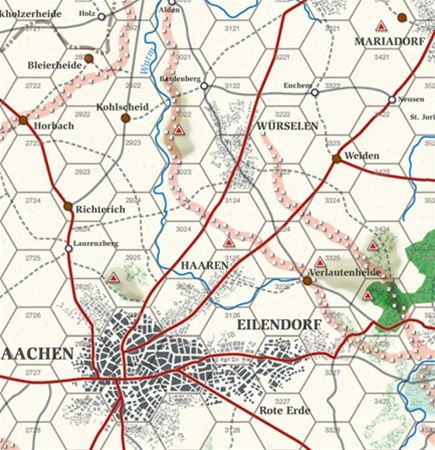 The area portrayed shows all primary and secondary roads, trails and other types of terrain in relation to their suitability for armor and infantry, along with all the villages, towns and cities that proved to be the bastions of the German defense, as well as every creek and river that couldn't be crossed by wheeled vehicles without a bridge. THERE are three main scenarios representing each of the offensive periods of September, October and November. 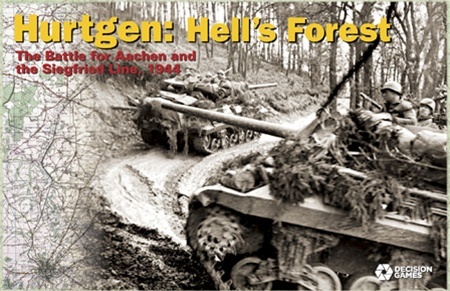 A smaller learning scenario depicts the US 28th Infantry Division’s ordeal as it attempted to drive on the Roer River dams through the forest of the area. Players may also play continuously from September to the first week of December (almost 300 game turns!). The big challenge for the allied player is to see if he can reach the Rhine River months ahead of the actual date, and shorten the war considerably. Extensive supply, weather and air power rules are included. THIS latest edition of the Grand Operational Simulation Series (which began with Wacht am Rhein) presents further refinements to the combat, artillery and supply subsystems in order to better depict tactical and operational warfare at this scale. For example, rules for “Lull” periods have been added in order to allow players to speed up game play during periods of relative inactivity. These Lulls compress game play from three turns per day to one, allowing players to cover longer intervals of historic time. Other additions feature level-two entrenchments that allow the German player to create fortified bastions in German towns and cities that can better withstand Allied barrages and ground assaults, along with rules that represent the logistical nightmare faced by the Americans during much of the battle. THE orders of battle have been extensively researched in order to provide an accurate and functional depiction of the armies of both sides. The incredibly hodge podge nature of the resurrecting German army is shown through the depiction of the various rear area units and replacement army battalions that appear almost randomly throughout the game. • Units: Infantry and Artillery are battalions. Armor is depicted at the company level. • Each strength step is equal to a company.